(Friday 29 March 2013) A chance meeting and request for translation brings together Tenzin Tselha, the grassroots coordinator of Students For A Free Tibet – India, and Thupten, a Chushikandru freedom fighter from Kham. On a lazy afternoon I met Angela, a reporter from Germany, She wanted to do a report on Tibet Guerrilla (CHU_SHI_KAN_DRU) and the slothfulness rest a leave and I started getting into action. Which made me inspired by another freedom fighter from Kham. His name is Thupten and he is a hero, who contributed, sacrificed and did what he could do for Free Tibet. She asked me to interpret the conversation between them, while I was translating; thousands of questions were spewing in my mind. As the story goes further, Angela began to ask questions about the incident when Tibetans were forced to return their arms and ammunition to the Nepali Government. Wearing with the feeling of chauvinism, I can indeed empathized and can sense the sadness in his voice, and according to my friend the glow of his eyes changes as he continued with the story which I missed. I began to wonder about the anger, hatred towards the Nepal government at the time. However, he being a true Buddhist practitioner and an ardent believer of His Holiness the Dalai Lama denied any kind of hatred and anger at that time. But there were people who committed suicide after the surrender, and I felt the betrayal, frustration of the Chu-shi-Gan-Dru soldier at that time. 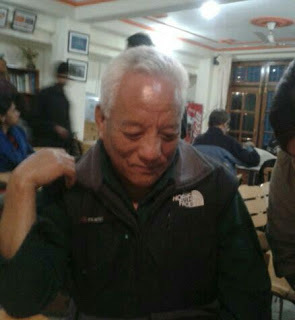 Though many people had lost their life and were disappointed by offering their lives in flames, however Thupten la continued serving the Tibetan army special frontier force for some time, after that he became the bodyguard of His Holiness the Dalai Lama, he is still serving the community as a general Secretary of the organization. Hence, I have the greatest of my humble gratitude and I compiled my nerves with all the warm respect for his generous contribution towards our country. He is not only a man but a patriot who adds an enormous development for our betterment. Part of me, handing my two little ears to his musical stories and a cup of coffee that I had shared once upon a time was a day that I still longed and blessed. One fine day, when we walked into his office and we met Ama Adhe who was the longest-serving political prisoner, we actually came to know that they were friends, two patriots who sacrificed their life for the country. He never stop loving and serving his country after the betrayal, chaos and unrest. Thupten la is an epitome of sacrifice and love for his own country, yet he does not hate the oppressor and the betrayer instead he is compassionate towards the opponent. ‘NEVER GIVE UP’ was one of the most popular quotes by His Holiness the Dalai Lama, Thupten la is again a patriot who followed what he said and he still following it. This entry was posted in Bloggers by Mandie McKeown. Bookmark the permalink.